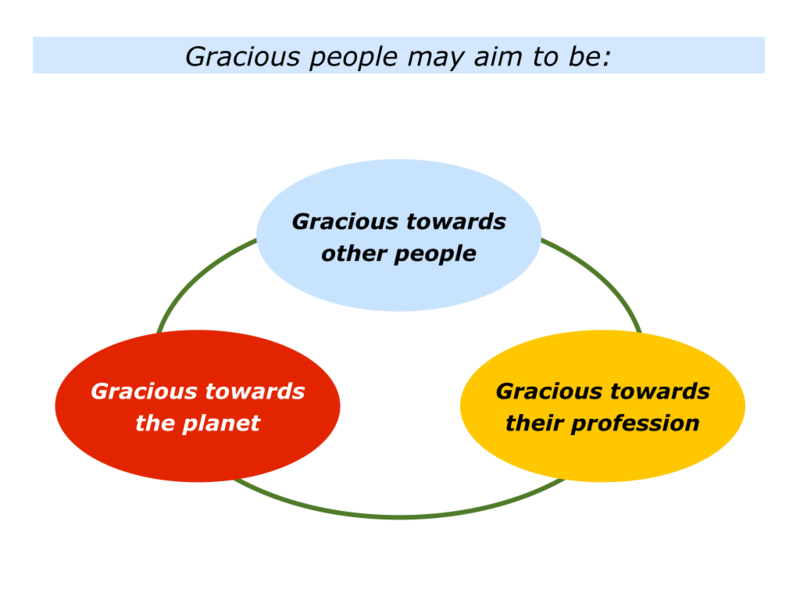 There are many definitions for the being gracious. The one we are exploring is when people show the qualities of being kind, humble and respectful. 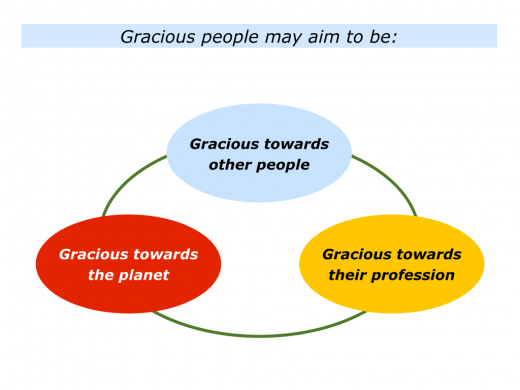 Some people show graciousness toward others. They make people feel welcome and listen to them carefully. They may have strong opinions themselves, but they aim to be kind towards other people. Some people show graciousness towards life, even when going through tough times. Those who experience an illness or loss sometimes show gratitude for what they still have in life. They demonstrate a sense of perspective and peace. Some people are gracious towards their profession. Some sports people do their best, for example, but are respectful towards both the event and other competitors. They demonstrate good manners in both victory and defeat. Some people show graciousness towards the planet. They aim to walk lightly on the Earth. They believe it is vital we treat the planet in a way that is grateful, rather than greedy. Such people want to pass on a beautiful planet to future generations. 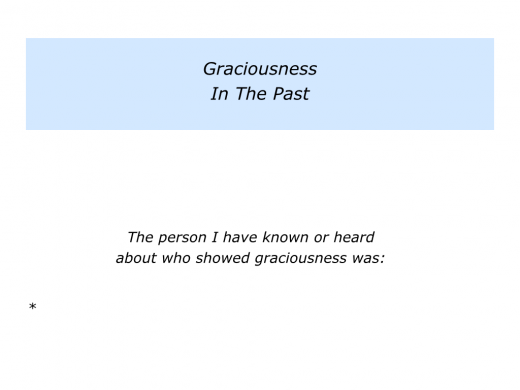 Looking back, can you think of a person who has shown graciousness? 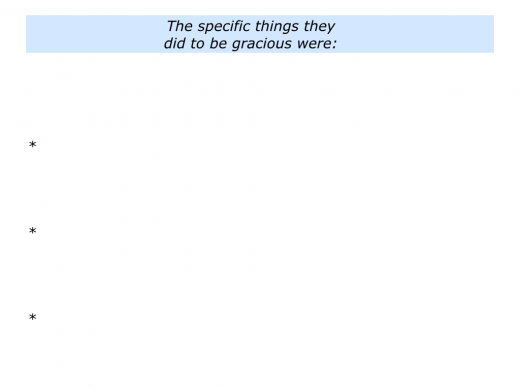 How did they show kindness, humility or respect? 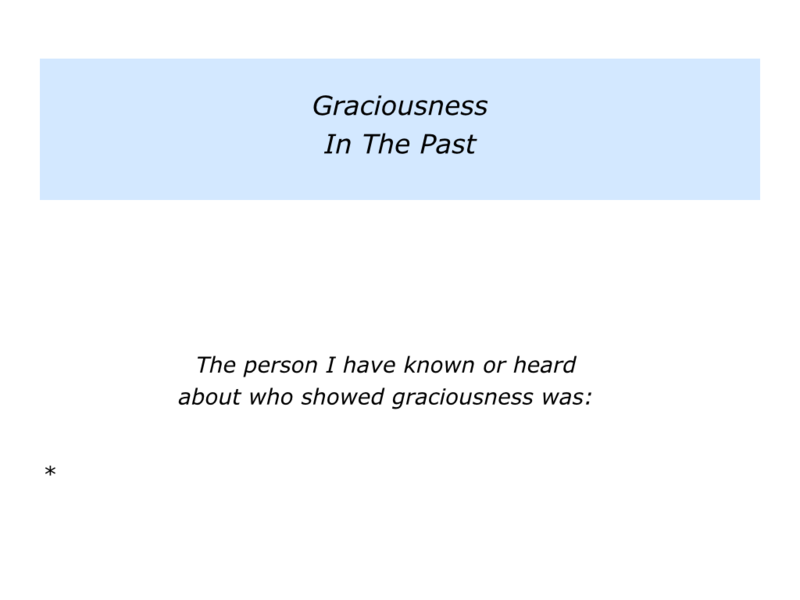 Describe a person who you have known or heard about who showed graciousness. 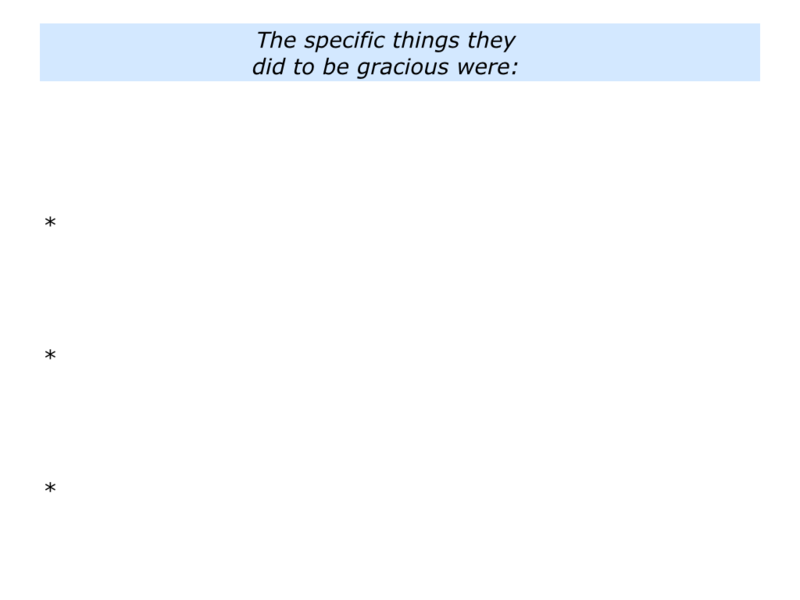 Describe the specific things they did to be gracious. Different people show graciousness in different ways. Some people demonstrate it through the Buddhist concept of Right Livelihood. This is part of The Noble Eightfold Path, which encompasses the following principles. 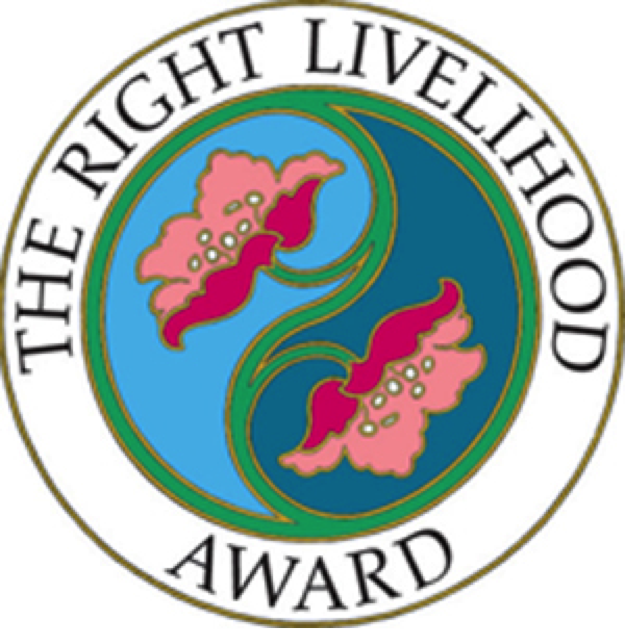 The Right Livelihood Awards, for example, are given to people who follow these principles in their daily lives and work. Known as the Alternative Nobel Prizes, these highlight those who do positive work that helps both people and the planet. Wangari Maathai, for example, gained the Right Livelihood Award in 1984 and the Nobel Peace Prize in 2004. Whilst using fighting spirit to overcome adversity in some areas of her life, she showed graciousness towards the planet. Best known for her work with the Green Belt Movement in Kenya, she also acted as a positive model for people. During her life she recruited hundreds of thousands of people who planted more than 40 million trees. Jakob von Uexkull founded the Right Livelihood Awards in 1980. Born in Uppsala, Sweden, he came from a family of pioneers. He went on to become a philatelist and stamp trader. The latter led to him creating a successful business, which he sold to fund the first five years of the Right Livelihood Awards. You can discover more about the awards via the following link. His initial move was to approach the Nobel Foundation. The original categories for the prizes had been set in a different world, said Jakob. Would it be possible to create awards for people tackling the present challenges facing humankind? 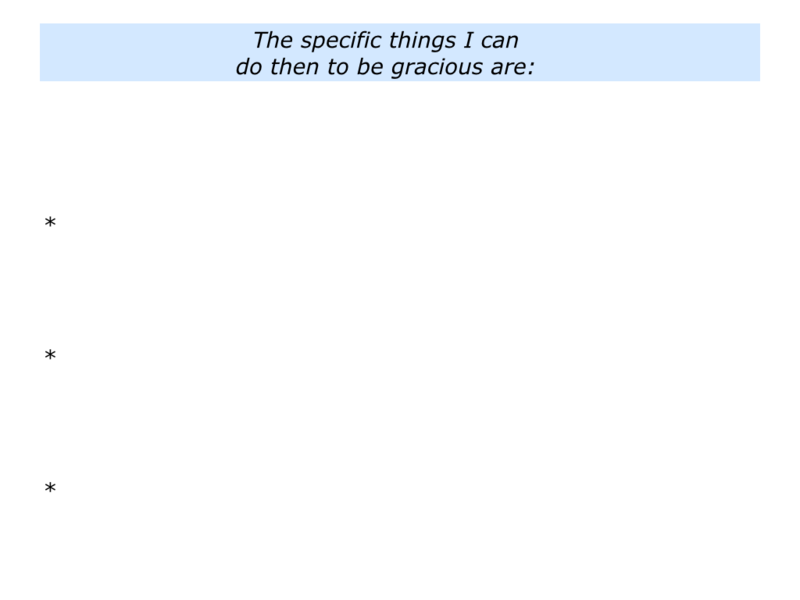 The Nobel Foundation were polite, but said that no new categories would be added. Jakob responded by creating the Right Livelihood Awards. He explains why in the following way. The idea of ‘right livelihood’ is an ancient one. It embodies the principle that each person should follow an honest occupation, which fully respects other people and the natural world. It means being responsible for the consequences of our actions and taking only a fair share of the earth’s resources. In every generation, there are groups of people and individuals around the globe who valiantly uphold these principles of right livelihood. They should be the stars in our human cosmos; instead their work often entails personal sacrifice, being opposed by powerful forces around them. The Right Livelihood Award exists to honour and support such people. Some people show graciousness towards other people, some show it towards their profession. Some people even show it in the competitive world of sports. Jack Nicklaus, the legendary golfer, showed it in a remarkable act of sportsmanship when playing Tony Jacklin in the final match of the 1969 Ryder Cup. The US and Britain were tied as the two players approached the final hole. This meant that, as the holders, the US would retain the trophy if the hole was halved. If Nicklaus won the hole, the US would be recorded as winning – rather than simply retaining – the Ryder Cup. Nicklaus sank his putt and this left Jacklin needing to hole a difficult putt to draw the match. After holing his own putt, Nicklaus immediately walked across the green and picked-up his opponent’s ball. He opted to concede Jacklin’s difficult putt. Nicklaus was criticised by some people. His response was to cite his friendship with Tony Jacklin. He felt a duty his friend, rather than pile on the pressure of potential failure. The record books were not as important as the friendship. Let’s return to your own life and work. 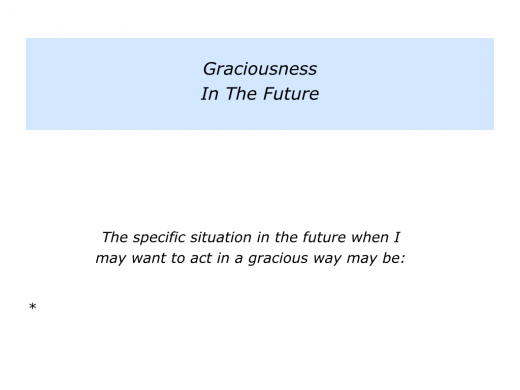 Looking to the future, can you think of a specific situation when you may want to act in a gracious way? You may, for example, envisage facing a difficult challenge. 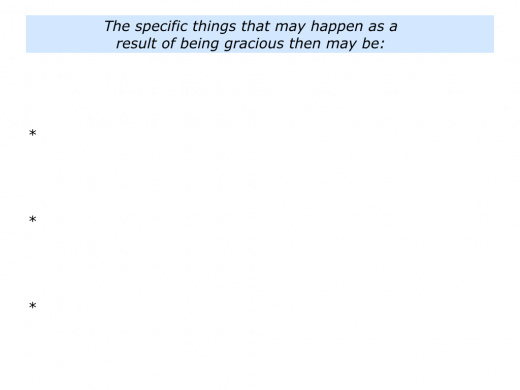 How can you be gracious in the situation? What may be the result of following this path? Describe a specific situation in the future when you may want to act in a gracious way. Describe the specific things you can do then to act graciously. 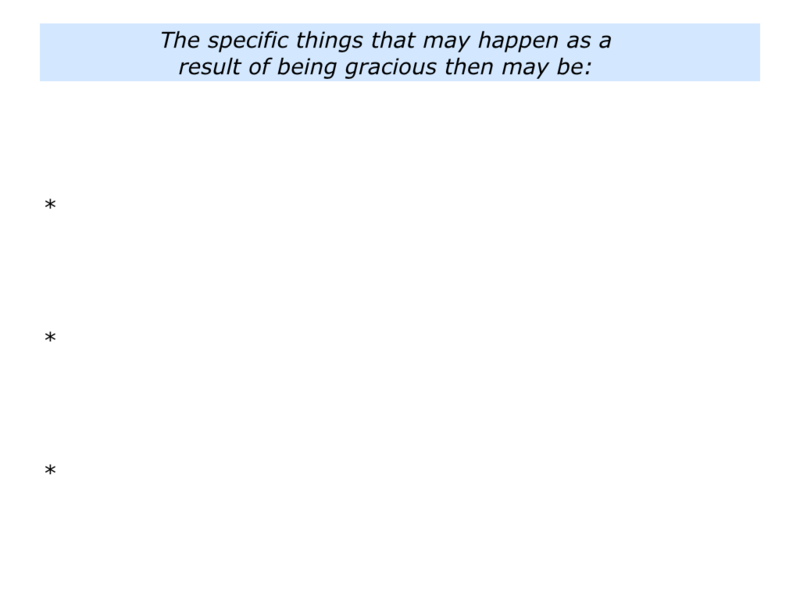 Describe the specific things that may happen as a result of acting graciously in the situation.